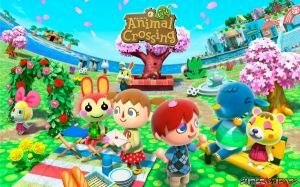 The game is the latest installment in the Animal Crossing series where players have the play the role of the town's mayor and run their town as they see fit. The game allows the players to partake various activities which are both essential for them to build their ideal vision of the town and for them to earn Bells, the game’s form of currency. The game is also tied to the system’s internal clock which affects the times the shops open, the wildlife you’ll encounter and events. This will also affect the wildlife you can catch per season. With the power of being the town’s mayor, players will have more options and involvement in customizing their ideal town in the form of Public Works Projects and Ordinances. This guide will provide necessary tips/ help for startup mayors and lists of items, creatures and collectibles you can find in the game. I LOVE THIS STUPID GAME!!!!! (although its not stupid) but, one question, how do you get rich? Hey! I totally love animal crossing new leaf!!! It is like totally awesome tell me how to, um.................................................. totally like get a lot of bells!!!!!!! I like need to pay off my loan!!!! Oh, and um by the way, my name is Kendra!!! Nice to meet you!!!!!!! 1. ways u can glitch!!! 2.A glitch is a thing where u can run on train tracks swim in river(without wetsuit)!!!! !And go through items!!!!! 3. the item u use is called a tweeter!!!! U can use it when u get street pass!!!!!!!! (but u have to use a amount of streetpasses!!!!!! Hello? i've tried alot of this stuff, and about half of it works. Personally, i think you should play it for yourself, and figure it out by yourself. Just my opinion. PEACE! my mom has hidden my nintendo for don't know 1 week or something, i'ts just 2 boring without it. Animal crossing super easy money cheat! 2.Save and quit the game. 3.go to system settings and change the year all the way up. 4.Load the game back up. 5.Go back to your bank and you will have 149,000 bells in there and you take out 99,999 bells and use it for what ever you want. Where is the cheats in this? Unlike The Others I Am Giving Advice About Animal Crossing So Lets Get Started:How To Get A Boat Ride:Go to the 4th of july there will be a specil guest .Tortimier.so Tortimier will tell you to stop by your dock later that day .Tortimier will tell you to go back the next day so do it. Also bring 1,000 bells .by the way this advice is for new leaf. 333Share Your Friend Codes Here & Play Together! 1Which Fruit Is Your Town's Native Fruit? 36CLONING 99K BAGS OF BELLS!! !